Humans are drawn to daredevil acts, especially when the odds of coming out unscathed seem next to impossible. 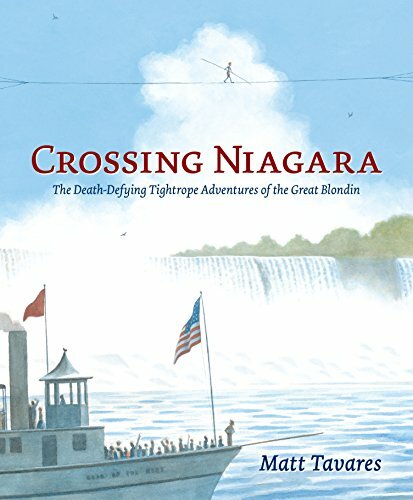 In the dashing new picture book, Crossing Niagara: The Death-Defying Tightrope Adventures of the Great Blondin by author/illustrator Matt Tavares, it seems fairly certain that the Great Blondin will plunge to his watery death when he tries to walk a tightrope across the mighty Niagara Falls, so thousands of spectators rush to witness his end with their own eyes. When he and his circus troupe visit Niagara Falls, crossing the mighty Falls on a tightrope becomes his obsession. With the full support of a local newspaper (whose owners believe they’ll make a fortune selling papers), and ogled by spectators who arrive by train, horse and buggy, and steamship to see if he will survive, the Great Blondin takes his walk. Then because he is a showman to his core, he stops in the very middle of the tightrope and stands precariously over the Falls below. As the crowd holds their breath, the Great Blondin drops a ball of twine down to a friend below and hauls up a bottle of liquid, which he swigs as he toasts his spectators on both sides of the river. After this blockbuster success, the Great Blondin sets out to best himself by doing even more impossible tightrope walks that include sitting and reading a newspaper, standing on his head, and even allowing himself to be blindfolded. And this is where Matt Tavares’ illustrations really shine. He cleverly uses the book’s oversized format to offer sweeping illustrations that juxtapose the height, breadth, and roaring splendor of the Niagara Falls against a super-thin line high in the air that represents a fragile tightrope, and a barely distinguishable speck with arms that represents the fearless Blondin making his way from America to Canada on the other side. Tavares’ other illustrations show faces of rapture, skepticism, or abject horror as the Great Blondin lays flat on the tightrope or stands on one leg. During one walk, the Great Blondin even carries a man on his back. There is also a clever bonus midway through the book when the left and right spread fold out to become four illustrations of the Great Blondin at his tightrope shenanigans: walking in leg irons, balancing on stilts, pushing a wheel barrel, walking with wooden planters on his feet, and even balancing a chair in midair. This book is full of nail-biting fun and is great for a historical look at extreme sports, daredevilry, and family entertainment. It can also be used as supplemental reading in an American History classroom or as a great addition to any budding adventurist’s library. The fast-paced prose is just as much fun as the illustrations and manages to shine the light on the Great Blondin’s humor as well as his singleness of purpose.